Here in the U.S., if we hear the words “the Battle of Manila,” we generally assume they refer to the WWII battle that took place in the Philippine Islands in 1945. That’s a reasonable assumption, but long before U.S. General Douglas MacArthur attempted the liberation of the city of Manila in the Philippines, the U.S. fought a lesser-known Battle of Manila—one that began with a scream halfway around the world. Both battles were crucial for the U.S. interests in Asia, and both battles marked major turning points for the people of the Philippines. There ends the similarity. Carlos Céspedes’s scream was the Declaration of Independence for Cuba, a country which, from the point of view of most Cubans at that time, was suffering a brutal Spanish occupation. Knowing that Cuba’s Spanish occupiers worked for a government that considered Cuba to be part of Spain’s national territory, Carlos took the precaution of committing to writing his Declaration of Independence for Cuba. Most Cubans thought independence was a sensible idea. Most Spaniards thought it was the worst idea since Napoleon decided to visit. Before it was all over, Carlos’s particular grito, or scream, would be heard as far away as Manila and in every village in the Philippines. Unfortunately for Spain, before that scream could echo off the stout walls of Intramuras in Manila, it registered in the ears and minds of revenue-conscious and often-bored-but-always-creative newspaper owners in the U.S. Within a year, the revolutionary Cubans had selected Carlos as their leader. Loud though his scream was, Carlos did not live to see Cuban independence. In 1873, he lost his position as the leader of the Cuban revolution and went into hiding in the mountains. The following year, the Spanish found him and executed him, but the revolution he began continued on. In 1878, Spain grew tired of the high cost of the war in Cuba and signed a treaty that freed most of the slaves and promised improvements and more rights for Cubans. But the treaty did not grant Cuba her independence, and Carlos Céspedes’s grito was not done echoing. The yearning for Cuban independence continued to smolder, and in 1893, another Cuban philosopher, José Julián Martí Pérez, founded the Cuban Revolutionary Party in New York City. José Martí carried forward that cry for independence. Martí returned to Cuba to help incite a new revolution in April of 1895. One month later, he died while attempting to inspire Cuban fighters by charging a Spanish stronghold on horseback. Like Carlos Céspedes, he did not live to see his native country free, but his writings and his devotion to democracy and freedom helped inspire the Cuban people to achieve their independence. Halfway around the world, another philosopher had been inspired by Carlos Céspedes’s scream. The Philippines’ most beloved native son, Doctor José Protasio Rizal Mercado y Alonso Realonda, had attended both the University of San Tomas in Luzon and Madrid University in Spain, and he had traveled extensively from a young age. He had grown tired of the Spanish occupation. José Rizal was never one to do much screaming. He was more of a listener and a quiet thinker. He was also a powerful writer, heavily influenced by the European philosophers of his time. Rizal wanted freedom and democracy for his native Philippines, but the revolutionary groups that were forming there did not enthrall him. He felt that a Filipino revolution against Spain without adequate education and a clear national identity with democratic ideals would not be an improvement for the people of the Philippines. In 1887, José Rizal published his seminal work called Noli Me Tángere, which is Latin for “touch me not.” The gentle whisper of the thoughtful young doctor spread through the Philippines and inspired his countrymen to stand up against the Spanish occupation. However, to Rizal’s dismay, the uprising turned extremely violent by 1896. At that time, Rizal volunteered to go to Cuba to help doctor the victims of an outbreak of yellow fever. The Spanish intercepted his ship in route arrested him. In spite of his public denouncements of the violence and his constant pleas for peaceful dialogue, Rizal was charged with inciting the violence in the Philippines. José Rizal was convicted for imaginary crimes and sentenced to death. On December 30, 1896, he was executed by firing squad. Even so, his words refused to die. After his death, his sister recovered his last poem, Mi última adios . . . My Last Farewell. It had been hidden in his small portable stove in his cell in Manila. She and Rizal’s friends saw that it was published. There was no way they could know the eventual impact of their choice. The increasing violence in Cuba and the Philippines caught the attention of Europe and the U.S. A few weeks before Rizal’s execution, U.S. President Grover Cleveland and his cabinet had carefully considered a secret report by Naval Intelligence Officer William Kimball. Kimball concluded that the Spanish Navy, though well trained and well led, was vulnerable due to years of inadequate maintenance. Kimball was aware that the U.S. maintained only a small professional army of about 25,000 men. He recommended that the U.S. use its growing naval power to intervene in Cuba and the Philippines by conducting naval blockades and, if necessary, conducting a naval bombardment of locations on Spain’s Mediterranean coast. U.S. President Grover Cleveland called on Spain to bring the uprisings to peaceful conclusions and announced that the U.S. would consider intervening in Cuba if the bloodbath did not stop. By 1897, U.S. newspapers such as William Randolph Hearst’s New York Journal were publishing increasingly one-sided reports about Spanish barbarism in Cuba and the Philippines. Though there were no shortages of real atrocities to report, the newspapers often reported pure fantasy. This inflammatory press coverage fed America’s sympathy for the Cuban people. In March of 1897, U.S. President William McKinley was inaugurated. A few days later, Emilio Aguinaldo was selected as the leader of the revolutionary government of the Philippines. The new U.S. President preached against involvement in the war between Spain and its colonies, but his position quickly lost supporters, due in large part to the yellow journalism being practiced by major U.S. newspapers. On August 8, 1897, an Italian anarchist assassinated Spanish Prime Minister Antonio Cánovas del Castillo. The assassination created instability in the Spanish government and hindered its conduct of foreign and colonial policy. On December 15 that year, Spanish negotiators paid Emilio Aguinaldo 800,000 pesos and agreed to grant the Philippines autonomy. In exchange, Aguinaldo and his cohorts agreed to a voluntary exile in Hong Kong. 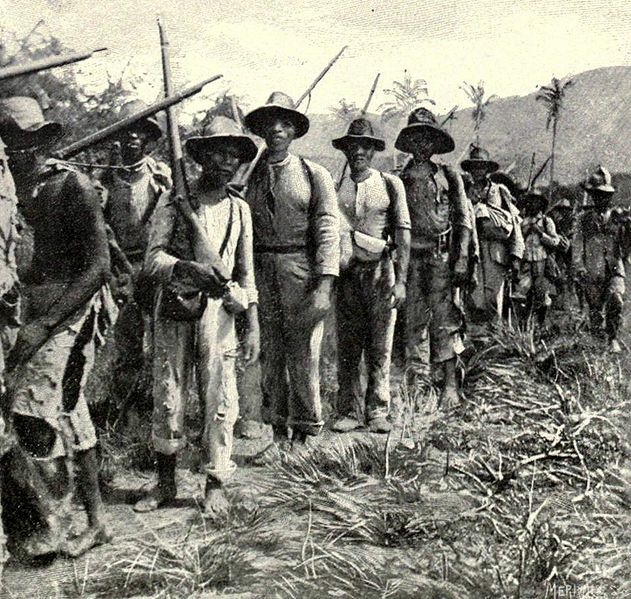 Spain granted “limited autonomy” to the Philippines on January 1, 1898. For many Philippine people, this declaration was simply too little, too late. Anti-Spanish sentiment in the U.S. was growing much worse. In Cuba, violence was increasing. The U.S. was concerned for the safety of U.S. citizens in Havana. Since the U.S. was still politically neutral in the conflict, it received the approval of the Spanish government to send the battle cruiser USS Maine to Havana harbor. On February 15, 1898, the USS Maine exploded while at anchor in Havana harbor, killing 270 U.S. sailors. Navy investigations concluded that a mine likely detonated near an ammunition magazine and set off a fatal explosion, which caused the battle cruiser to sink rapidly. The Navy investigators made it clear that they had no information as to who might have placed the mine. Nevertheless, most newspapers in the U.S. reported that the Spanish had placed the mine. The public outcry for war against Spain gathered momentum. Newspaper sales reached new records in New York and other major cities, and advertising revenues skyrocketed. Carlos Céspedes’s grito echoed once more, and on April 11, President McKinley bowed to public opinion and requested permission from Congress to take military action against Spain. On April 13, Congress approved President McKinley’s request. America entered the war. In the next installment, we will look at how this Battle of Manila unfolded, and the power of a poem. I enjoy your historical analyses and I look forward to part 2 of this story. Good stuff, Jay…You know the damndest things. Most of what I know of world history, I pick up here. Keep it comin’.